Maria Sharapova crashed out of the AEGON Classic at Edgbaston, going down 6-4, 6-4 in the semifinals to Li Na. Sharapova will now spend next week practising at Wimbledon SW19 as she continues to rebuild her career following a serious shoulder injury. "After such a long layoff, every match and every situation is a different test to the body," said Sharapova, the 2004 Wimbledon champion. "I still felt like I had many chances in this match, but I have played five matches in the last six days and after that you just hope you wake up with that intensity you need. Against her you need that." Li will play Magdalena Rybarikova at the final after defeated Sania Mirza 3-6, 6-0, 6-3. Andy Roddick suffered a huge blow after he was forced to retire with an ankle injury during the first set of his Queen's Club semifinal against compatriot James Blake. He called for treatment three games into the match and resumed after having his ankle and foot heavily bandaged. However, Roddick was clearly still in some discomfort as he served in the next game and decided to take the safety-first option with Wimbledon starting in just nine days. Blake, who was a finalist here back in the 2006, admitted he did not take much pleasure from this victory. 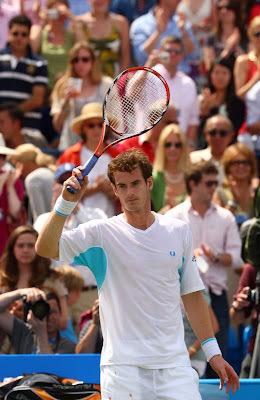 "It was unfortunate but Andy is such a great player and he doesn't want to endanger the injury anymore," Blake said. 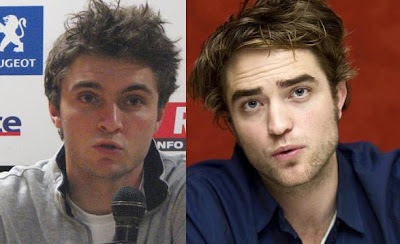 "He normally moves so well and you could tell this wasn't the same Andy Roddick." The American will now try to stop Andy Murray who is bidding to become the first Briton to win the pre-Wimbledon warm-up event since 1938. Earlier, Murray completed a ruthless 6-2, 6-4 win over Juan Carlos Ferrero. "I felt it was a good match. I started well but the second set was very close," Murray said. "I'm obviously happy to win in two sets. I was very happy with the way I played all round." "I didn't have the easiest draw so it's been a good week all around and hopefully I can finish it off on Sunday." When was the last time Roger Federer get touchy-feely with Mirka in public? 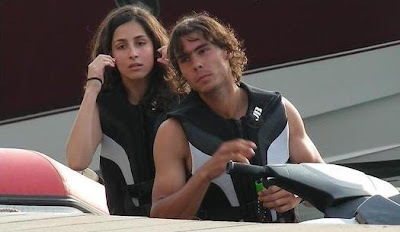 It's not easy to see tennis stars showing off their love and affection to their partners in public. These are some rare photos of Roger Federer and Mirka, which could due back to 2005. Time flies... they are now married and baby Federer is due soon, probably just two months from now. After a disappointing French Open where she lost to eventual champion Svetlana Kuznetsova in the quarterfinals, Serena Williams was spotted showing off her curves and guns while shopping for some expensive denim. Serena was at True Religion brand jeans store on Robertson Blvd. in Los Angeles, California earlier this week. After shopping, she sped off in her cherry red Bentley. Check out the last two photos. Serena can cause quite a stir when she's out shopping. Coming back to tennis, hopefully Serena will come back stronger for Wimbledon, although I believe her sister Venus will perform better on grass court. Former Australian Open champion Thomas Johansson is quitting professional tennis after more than 15 years on the ATP tour. 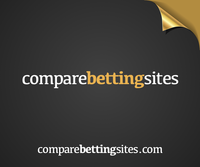 The 34-year-old Swede won nine singles titles and reached a top ranking of no. 7 in 2002. However injuries forced him to take long breaks from the game in recent years. “After a lot of thinking, I have now decided to step off the train and end my professional tennis career,” he said in a statement Friday. 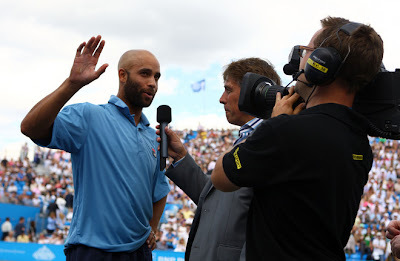 Johansson said the biggest moments of his career were winning the 2002 Australian Open title and reaching the Wimbledon semifinals in 2005. 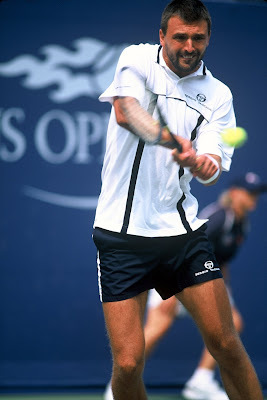 He was also part of Sweden’s Davis Cup-winning team in 1998 and won an Olympic silver medal in doubles in Beijing last year with Simon Aspelin. Perhaps the recent success of his compatriot, Robin Soderling at this year's French Open convinced him that Sweden tennis has a new future. Instead of fleeing the paparazzi, former tennis champ Boris Becker, 40, and his bride Dutch model Lilly Kerssenberg, 30, have made the right decision by inviting the media to their wedding ceremony in St. Moritz, Switzerland. She's lovely in this white tuxedo suit. 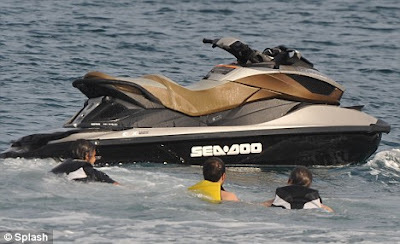 Among the guests who attended the less-than-private wedding ceremony were Prince Albert of Monaco, supermodel Claudia Schiffer and former cyclist Jan Ulrich, as well as Becker's two sons, Noah and Elias. The newlyweds announced their plans to wed on a German chat show earlier this month. Becker's eldest son Noah, left, and Elias, right, wait for the bridal couple in front of the Segantini Museum. The Beckers wave as they set off for their reception together. No wonder Justine Henin has no interest to go back to tour. She's slowly and surely building up her career in the entertainment line. 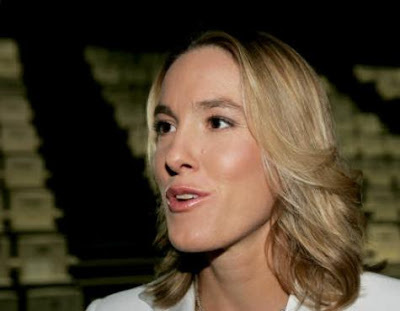 In her next project, Justine Henin will make her threatrical debut in October with a role in the comedy "Arrête de pleurer Pénélope" (Stop Crying, Penelope!). The production will tour in the French-speaking area of Belgium this winter. The former world no. 1 has appeared in several TV productions since retiring from tennis, including a reality series called "The 12 Tasks of Justine Henin" and a cameo in the primetime French soap opera "Plus Belle La Vie." 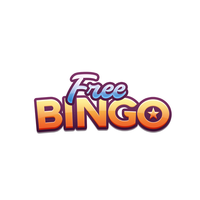 Damir Dokic goes to jail; Is this the beginning of the end of the broken family? Speaking about bomb threat, Jelena Dokic's father, Damir who threatened to blow up the Australian embassy in Serbia back in May has been sentenced to over a year in prison. Dokic was given 10 months in prison for phone threats made against the ambassador and seven months for illegal possession of weapons. He is expected to serve a total sentence of 15 months. Dokic threatened the ambassdor last month after an interview with Dokic's estranged daughter Jelena appeared in an Australian publication, in which Jelena confirmed that her father had beaten her while serving as her coach on tour. The Serbian newspaper Vecernje Novosti reports that Jelena may be flying to Serbia to see her father. This is a sad ending but it could be a new beginning for the Dokic family. Queen's Club was hit with bomb scare. 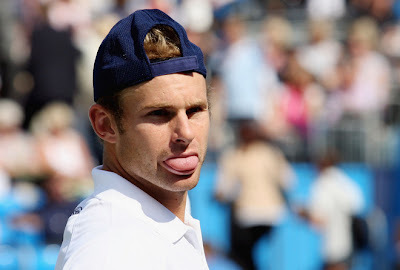 The match between Andy Roddick and Lleyton Hewitt was delayed when a note containing a bomb threat was discovered on one of the walls at the tournament. After a search of the grounds, the match was allowed to begin, where Roddick defeated Hewitt 7-6(2), 7-6(4). Tournament officials, who initially said the match was being delayed because of technical issues, disclosed that a spectator had discovered a bomb threat message pinned to a wall. However, a security sweep found nothing. While waiting for about 20 minutes, the two former champions chatted at the net. “Obviously, your concern is making sure everyone is safe,” Roddick said. “There wasn’t really much to be done, and I know they were trying to decide what they were going to do. First of all, it's not what you think. 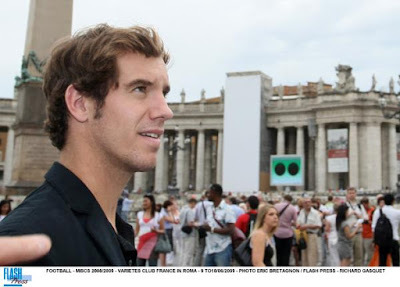 It's not like Richard Gasquet meeting Pope Benedict XVI to ask for blessing or forgiveness. 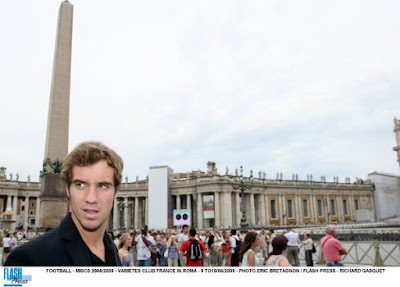 Gasquet was recently spotted waiting for the arrival of the Pope prior to the weekly general audience in St. Peter's Square at the Vatican. He was there to attend a charity football event organised by Variétés Club France. 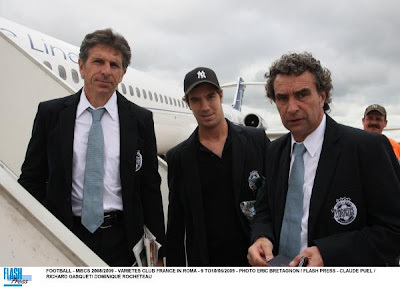 Richard Gasquet recently caught up in an alleged cocaine bust. He could face a two-year ban from professional tennis if found guilty. 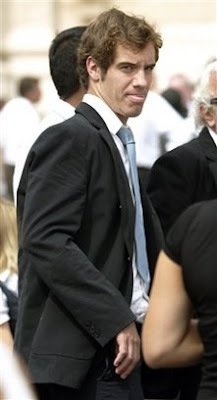 Gasquet however claimed he was innocence. 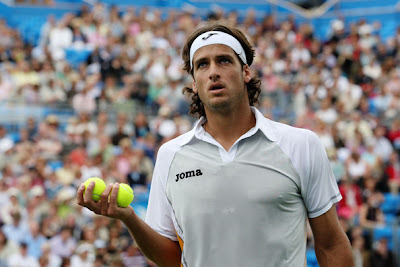 I'm not sure about you but I thought Feliciano Lopez is the best looking player on grass court tournament now. 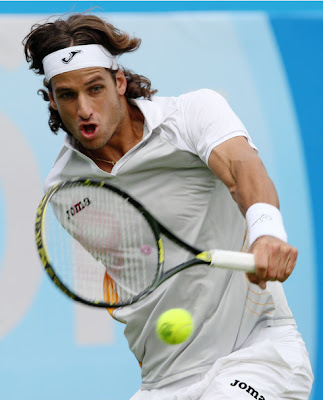 As a bonus, here's another picture of Feliciano. I have no idea why his face and his hand grabbing the two balls fascinates me. Ana Ivanovic announced on her website that she has split with her coach of three months, Craig Kardon. Kardon, a former coach of 18-time Grand Slam champion Martina Navratilova was hired on trial basis in February to replace Sven Groeneveld. However, Ivanovic's ranking continued to drop from no. 8 to no. 13 in this week’s WTA rankings after her French Open title defense ended in the fourth round. “I’d like to thank Craig for all his hard work,” Ivanovic said. While searching for a new coach, she will use temporary coaches for Eastbourne and Wimbledon later this month. Finally, Roger Federer decided to pull out of the Gerry Weber Open, his usual grass-court warm-up for Wimbledon, saying he is “overwhelmed” and “exhausted" after his French Open victory. The withdrawal came two days after Federer’s record-tying 14th Grand Slam victory at the French Open, the only major title that had been missing from his resume. “I sincerely apologize to the tournament organizers, my competitors, and my fans in Germany," Federer said Tuesday on his website. “It is hard for me to admit, but I simply cannot imagine giving my best effort in another tournament right away and I don’t want to risk injury if I am not 100 percent prepared." "I need to rest and recuperate,” the "Grand Slam Man" said. 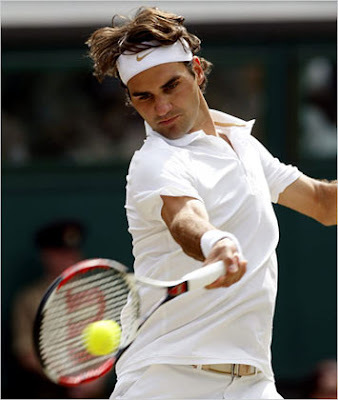 Federer has won the tournament in Halle five times, and four of those years he went on to win Wimbledon. By the way, before I post this on ebay and other channels, I would like to announce that I have a T-shirt (belongs to a friend) with Roger Federer and Pete Sampras autographs (yes, on the same t-shirt!) from the 2007 Clash of Times exhibition match held in Kuala Lumpur. There's nothing better than having two autographs of the champions and 14-Grand Slam holders in one T-shirt! There are only 2 T-shirts of its kind, so it's a limited edition whereby you can't get this elsewhere. Only 1 t-shirt is available for bidding. Anyone who's interested to bid for this valuable t-shirt, please send your bids to hcfoo7@gmail.com. The bidding price starts at USD$150. Only serious bidders and die-hard Federer and Sampras fans will be entertained. Feel free to contact me if you would like to have more info about the t-shirt, the exho event, postage, how to make payment if you won the bid, etc. Rafael Nadal held a press conference earlier today to announce his hope to defend his Wimbledon title. Nadal will travel to London next Tuesday despite his knee injury. 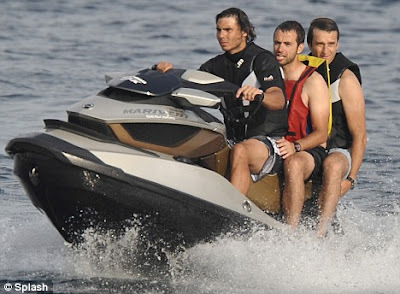 The top-ranked Spaniard said after two days of medical tests in Barcelona he has decided to try physical therapy to prepare for the tournament, which starts June 22. 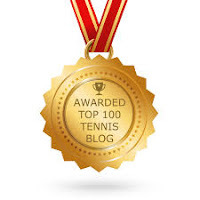 “I am going to give my 200 percent to be ready for the most important tournament in the world,” Nadal said. “I will not go out and play, especially on the Wimbledon Centre Court, if I am not 100 percent ready to play." 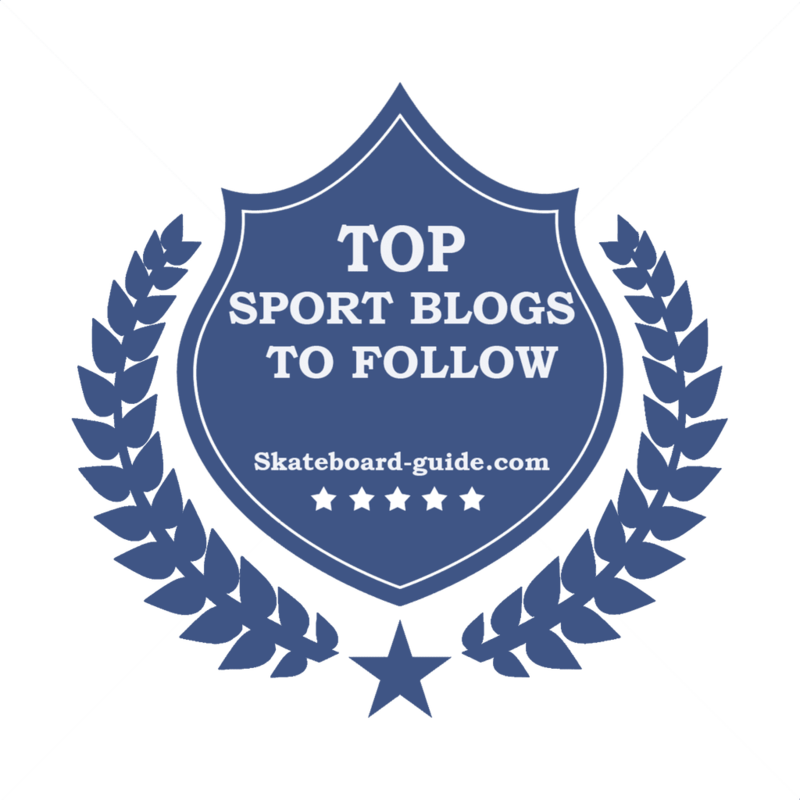 “I have been playing with pain on my knees for some months now and I simply can’t go on like this." “His treatment will involve oral anti-inflammatories, physiotherapy, as well as muscular exercises for both quadriceps,” Ruiz-Cotorro said. Nadal withdrew from the grass court warm-up event at Queen’s Club this week. He was the champion here last year. 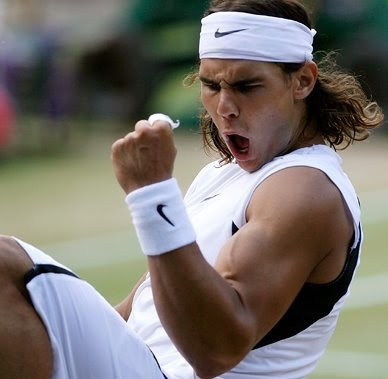 Let's see in a week or two whether Nadal will confirmed his participation at this year's Wimbledon. Is Andy Murray ready to play his best tennis on grass? Andy Murray will begin his grass season in the newly-named AEGON Championships at the Queen’s Club in London this week hoping that this will be an ideal warm-up to this year’s Wimbledon. Without the presence of defending champion and world no.1 Rafael Nadal, who opted out of the tournament due to a knee injury, Murray gets to be the no.1 seed. 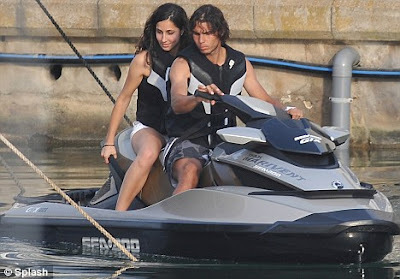 However, the British top player believes that Nadal will be back in time for Wimbledon. “I’ve played Rafa a lot of different times on a lot of different surfaces: we’ve practised together quite a lot as well, so we know we know each other’s games well,” said Murray. The Scot also said that the pressure on him to win his first Grand Slam is just a side show. “I had a good run at the French and feel good coming in here but I guess it’s the same for everyone," he said. "The grass takes a few days to get used to but I’ve felt good practising on it so far. Murray has been training in London since losing in the French Open quarter-finals last week. He has spent some time on the grass courts at Queen's, where he has practised with Lleyton Hewitt, who will be his doubles partner this week. First of all, I would like to say that I'm not the one who complained to Astro about the sudden commercial break during when Andre Agassi walked out to the centre court for prize-giving ceremony. Thanks to Astro for doing such a tremendous job in covering the recent French Open 2009, where Roger Federer won his historic Grand Slam title. Through the exclusive channel on Astro SuperSport+ (channel 816), Malaysian tennis fans were given the opportunity to watch incredible tennis matches through multiple screenings, both LIVE and repeat. When Federer’s semifinal match was not even shown LIVE in the USA, Malaysians have the privilege to watch it in the comfort of their own homes. So, thanks again and we're looking forward for more excitement in this month's Wimbledon. This commercial was shown shortly after Roger Federer won the French Open and his 14th Grand Slam title. Netjets congratulated Federer on his historic victory. Perhaps that commercial was filmed before the Australian Open?